A devil's Gospel revival played by a loose confederacy of musical degenerates in a tiki torch wilderness on the edge of the island of a million pleasant nightmares. 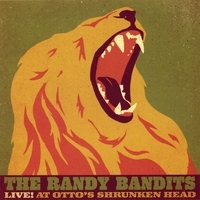 Recorded at the tail end of the Bandits' Holy Matrimony Tour '06, this live blast from the very near past captures the essence of The Randy Bandits at play in the fields of the pagan gods. In the back room of a tiki-torch-themed dive bar called Otto's Shrunken Head (on 14th St NYC), Jim, Russ, Sunny, Chris, Spiff and Stephen laid their souls bare and nerves raw in service of swell but now-deceased band Swell Mob's Avian Bird Flu Benefit. While the Bandits also made a recording the next night at the slightly more prestigious Living Room and subsequently at the world famous Knitting Factory, this is the recording that nails the spirit of the Bandits and captures a transitional performance in Bandits history. If you have loved the Bandits for years, saw them once or are just stumbling onto them, enjoy them here as raw and honest as any music has ever been.